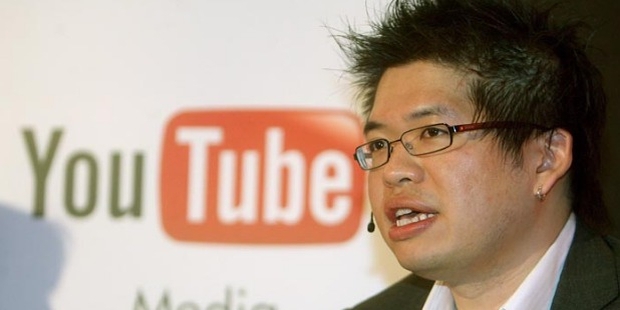 Steve Chen is a Taiwanese-born American Internet Entrepreneur. He is famous as the founding father of the most streamed video website YouTube. He was the Chief Technology Officer at YouTube. Eventually he started another company after selling YouTube to Google popularly known as AVOS Systems, Inc.
Steven Shih Chen was born in the year 1978 at Taipei, Taiwan. He and his family immigrated to United States when he was fifteen year old. He did his primary schooling from River Trails Middle School in Mount Prospect. He did his middle school from John Hersey High School. He attended Illinois Mathematics and Science Academy in Aurora, Illinois. At the University of Illinois at Urbana-Champaign, he studied computer science. Chen started his career at the Industry financial company PayPal which serves as an online payment gateway. He was also among the few early employees at Facebook, the number one social media website. He left Facebook after working there for few months as he was interested to start his own venture. In the year 2005, Steve along with Chad Hurley and Jawed Karim founded the online video streaming website YouTube. His position in the company was that of chief technical officer. In the year 2006, the three partners of YouTube sold their stake at the company to Google, Inc. for 1.65 billion US dollars. Steve Chen, Vijay Krishnamurthy and Chad Hurley have together founded AVOS Systems, Inc of which Mixbit, a video sharing service is very well known. They sold the stakes of AVOS Systems to Science, Inc. in the year 2014. 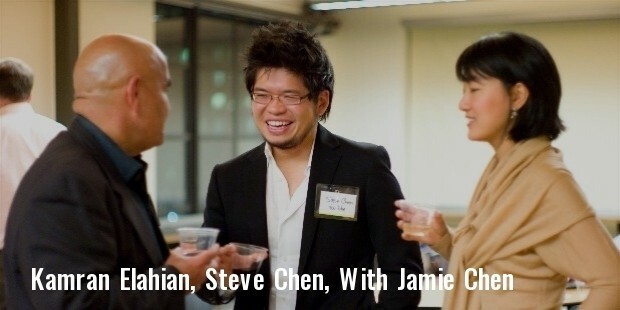 Steve Chen is known to have a lot of personal investment in various ventures. Some of these ventures are HonestBee, Drama Fever, Spool, Wish, Road hero and a few more. He is known to be as one of the strategic entrepreneurs. Steve has worked with some of the best online sites and gateways of the recent times; eBay, PayPal and Facebook. After the sale of YouTube the Google, Inc, the shares that he had received from Google is said to have a value of 26million US dollars after a year from his acquiring the shares. 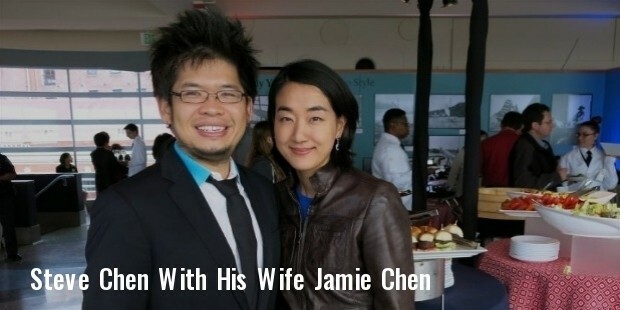 Chen married Park Jin-Hyun, who is now known as Jamie Chen. Together the couple has one boy child who was born in 2010. Steve Chen is an ardent lover of Art and the family makes contribution towards The Asian Art Museum of San Francisco. Steve has gifted the world with a different idea to venture start ups. YouTube is now one among the most watched websites worldwide and his success of MixBit is also at its peak. He has at present joined hands with Google Ventures to explore newer avenues. Steve Chen has been listed as One of the 15 Asian Scientists To Watch by the Asian Scientists Magazine. 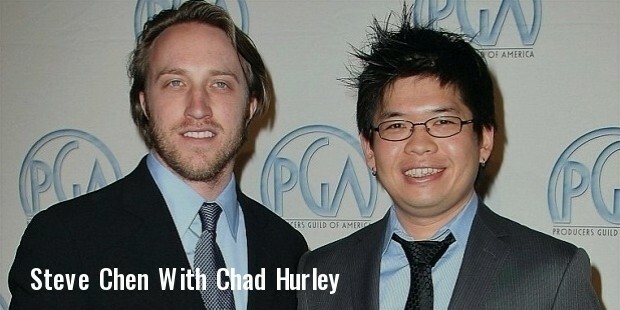 He has also won the Vanguard Award in the year of 2008 along with his partner Chad Hurley. Chen was also nominated as the one of the “50 people who matter now” in business by the magazine 2.0.